Winter, I’m sick of you. That’s right, you – I’m fed up. Go away and leave me alone. We’re through. I’m so tired of being cold. I know I don’t have it as bad as Maine, the home of one of my favorite bloggers. Modern Philosopher, I look at the photos of your snow mountains and feel your pain. These icicles outside my window make me feel like a damsel in distress trapped in an ice cavern. I’ve started to keep most of the shades down, and though this tenebrific action has reduced the draft, the lack of sunlight only adds to my consternation. The strident sound of howling wind doesn’t help. I’m sick of drinking hot tea, wearing multiple layers and walking around with a throw blanket wrapped around my waist. The frenetic weather forecasters drive my schedule: Oh my, I better get the food shopping done before the predicted snow squall/ weather watch alert/warning/ advisory, wind chill or near blizzard conditions! I’m looking forward to words like heat wave and blinding sun. Don’t be mistaken, I do appreciate the beauty of cascading snowflakes and the gleaming white blanket they form. 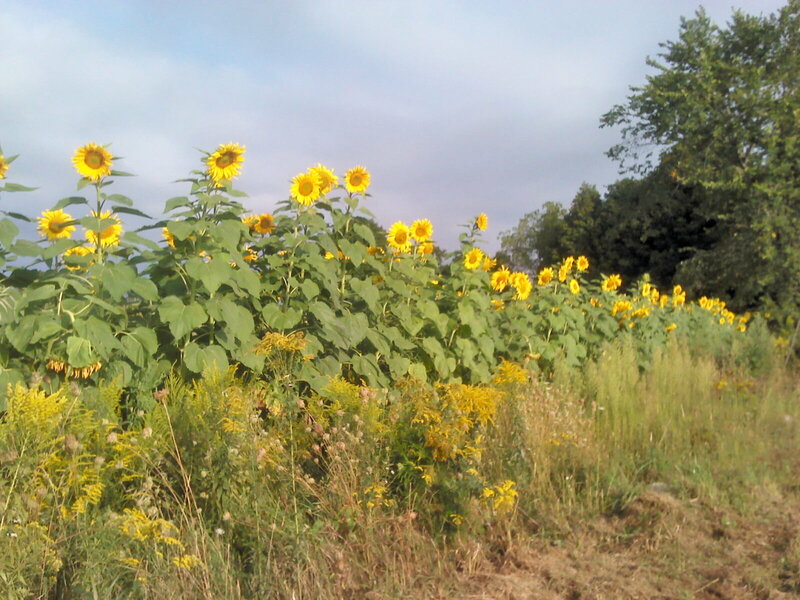 But, oh, how I miss my daily walks around the farmland, peering at the young crops and sunflowers rising from the earth. This is the indelible memory I dwell on as I wait for these gargantuan icicles to alight, hopefully before leaks appear on my newly painted walls. OK, enough whining for one day. Blogs are great for venting, aren’t they? I will. Its important to me. I just did the conversion – 87.8 degrees Fahrenheit – sounds delightful!